VANCOUVER, British Columbia--(BUSINESS WIRE)--Sierra Wireless (NASDAQ:SWIR) (TSX:SW), the leading provider of fully integrated device-to-cloud solutions for the Internet of Things (IoT), today announced the industry’s smallest, lowest power, multi-mode Low Power Wide Area (LPWA) cellular modules targeted at rapidly growing markets in asset tracking and connected industrial equipment, smart city, healthcare, agriculture and wearables. AirPrime® HL78 modules, featuring Altair Semiconductor’s integrated ALT1250 chipset, deliver best-in-class power performance extending the life of battery operated devices by 5-10X compared to other available LTE-M/NB-IoT modules. This new level of power saving modes, with improved wake-up and sleep mode responsiveness, as well as ultra-low sleep mode power, make HL78 the module of choice for any power-constrained IoT application. In addition to low-power performance unique to the HL78 design, the modules integrate GNSS tracking capability, security and an embedded SIM in a new compact CF3® size (18mm x15mm) that is pin-to-pin compatible with other HL Series modules. Customers have the flexibility to deploy the same device on global LTE-M (Cat-M1/eMTC) and NB-IoT (Cat-NB1) networks, with support for more than 20 LTE frequency bands in addition to optional 2G fallback. Built-in security, including HTTPS, secure socket, secure boot and free unlimited firmware over-the-air (FOTA) updates from the AirVantage® device management IoT Platform, helps customers ensure HL78 deployments are future proof and secure. LTE-M and NB-IoT LPWA networks deliver a new class of wireless technology specifically designed for low-power IoT applications [see infographic]. LPWA technologies combine lower cost, broader coverage and better battery life with globally available and secure cellular networks ready to connect hundreds of millions more things to the Internet. The AirPrime HL78 modules are fully compliant with the 3GPP Release 13 standard and are Release-14-ready to support NB2 features in the future. 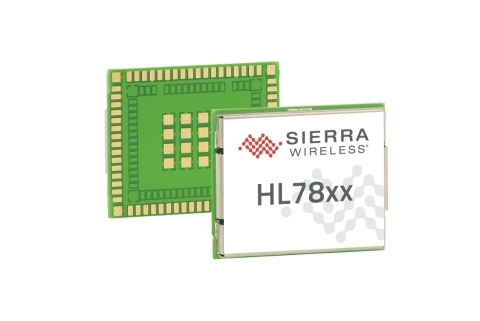 Sierra Wireless AirPrime HL and WP Series modules are the smallest embedded modules to be completely interchangeable across 2G, 3G, 4G and LPWA technologies. They use the CF3® form factor, which is footprint compatible across product lines, providing customers with the option to develop smarter by building their connected IoT product or service on a single module. HL7800 and HL7802 modules are sampling with lead customers now, with general availability in Q3 2018. For more information, visit http://www.sierrawireless.com/LPWA. Sierra Wireless (NASDAQ:SWIR) (TSX:SW) is an IoT pioneer, empowering businesses and industries to transform and thrive in the connected economy. Customers Start with Sierra because we offer a device to cloud solution, comprised of embedded and networking solutions seamlessly integrated with our secure cloud and connectivity services. OEMs and enterprises worldwide rely on our expertise in delivering fully integrated solutions to reduce complexity, turn data into intelligence and get their connected products and services to market faster. Sierra Wireless has 1,500 employees globally and operates R&D centers in North America, Europe and Asia. For more information, visit www.sierrawireless.com. “Sierra Wireless”, “AirPrime” and “AirVantage” are registered trademarks of Sierra Wireless. Other product or service names mentioned herein may be the trademarks of their respective owners. AirPrime HL Series supports LTE-M (Cat-M1/eMTC), NB-IoT (Cat-NB1) and 2G global networks in a compact CF3 module with best-in-class power performance.